After work I took a rare taxi ride to the Numazu port area to check out a bar called “Tap Room”. It is a small brew pub with a great view of the port. The house beer was fantastic, and they had a huge selection of (slightly expensive) snacks to go with it. One of Koalako’s friends was the live music for the night, singing English songs while playing acoustic guitar. We also got a free performance from another one of Koalako’s friends Shinya, who specializes in close magic. It was entertaining to watch him perform the same tricks twice, first in English and then in Japanese for the crowd at our table. Like most nights out, we all ended up at karaoke later on, ruining some songs over nomi-hodai. (2017 Update) The correct name of the place I went is Baird Taproom Numazu Fishmarket. The brewery is a local success story – the American owner and his Japanese wife moved to Numazu and opened a tiny brewpub. Supported by family, they slowly grew and now have 6 tap rooms and export overseas. Read more here then go and enjoy a delicious beer! After work I went out for some karaoke and drinks with Koalako and her friends in Numazu. Usually when I go out for karaoke, I’m with at least a few English teachers. Tonight I was the only non-Japanese person in my group, and possibly in the whole building as well. Koalako is functionally bilingual but her friends weren’t so it was a good chance to practice my Japanese. We had a lot of fun and I wasn’t completely awful at singing. On our way out, the karaoke remote had an unfortunate accident on the stairs to the front counter. We apologized to the staff and Koalako attempted to reassemble the remote for the staff. They acted like it wasn’t their first time to see a remote bounce down the stairs. Seriously though, who puts a bunch of stairs in a place where people are drinking? I woke up in the morning hungover and tired after traveling 9000km to attend Angie’s farewell party. My phone was buzzing – The Penpal had the day off and wanted to see me since I had been away for 2 weeks. I was looking forward to it, but the only problem was I was not alone in my room – Koalako was sleeping on my futon. Don’t get the wrong idea friends, Koalako slept on the futon and I slept on my folding floor couch. Nothing happened except sleeping, and I assume some drunk snoring (likely from me). Koalako was a good friend of Angie, and wanted to stay out at the farewell party as late as possible. However, the last train from Mishima to Atami is a lot earlier than the last train from Mishima to Numazu. Near the end of the party she realized that her only way home was a potentially very expensive taxi ride, so she asked if she could stay at my apartment. I agreed, not really thinking about how it would look if my girlfriend showed up to find my attractive female friend sleeping in my room. I woke up Koalako and told her that she would have to be out before The Penpal showed up. While she attended to her makeup, I ran across the street to 7-11 to pickup some onigiris for breakfast and some sports drinks to aid with our hangovers. My beverage of choice for hangovers is Amino Supply! Yum! I got Koalako out just before The Penpal showed up. The Penpal and I spent the afternoon together, hanging out and talking about my trip to Canada. I hadn’t realized how much I missed her while I was away. It was good to be back home in Japan! (2015 Update) This was the first of a few times where I was Koalako’s emergency “I missed my train and need a place to crash” friend. Yes, The Penpal does know that Koalako crashed at my place on occasion. After a harrowing experience with a hangover earlier in the day, I was once again on the move, this time heading from Koriyama to Atami to see my good friend Koalako. (again, not a real name – please see my cast of characters list) Fortunately for me, Atami was having their amazing summer festival during my visit. I have not been to enough summer festivals in Japan to give an objective opinion, but Atami’s has to rank near the top of the list. Atami is a resort town built on the side of a mountain beside a beach. It is well known for its hot springs and amazing fireworks. I also know it from its festivals, steep streets, and the time I had to sing Celine Dion for free beer. Unlike the rest of Japan, I don’t think anyone owns a bicycle in Atami. If they do, they are either the a fitness freak or or they spend most of their time walking the bike up hills regretting their purchase. Koalako was waiting for me at the train station. After a big hug (a friendly one – I am married!) we ditched my heavy backpack in a locker and started the long, steep, curving descent through the streets of Atami. Koalako had not used English for some time, so we started by alternating in my shoddy Japanese and her rusty English. Years of not using our second languages had created a bit of a language barrier, but we soon were talking like old friends again. About half way down we saw a street vendor selling “Atami beer”, a local brew in time for the summer festival. Koalako walked over and got us each a bottle. Yes, drinking in public in Japan is perfectly legal. Even though it was okay, I couldn’t overcome my instinct to hide the bottle every time we saw other people. Fortunately beer is a reliable instinct killer (especially cold, delicious beer), so by the bottom of the hill I was feeling much more relaxed about public consumption. We came to the main street in Atami which was lined on both sides with throngs of people and street vendors. After walking for a bit, we stopped on the corner of the main street and a major side street. The police blocked off the side street which gave us a chance to get front and center for the festival. 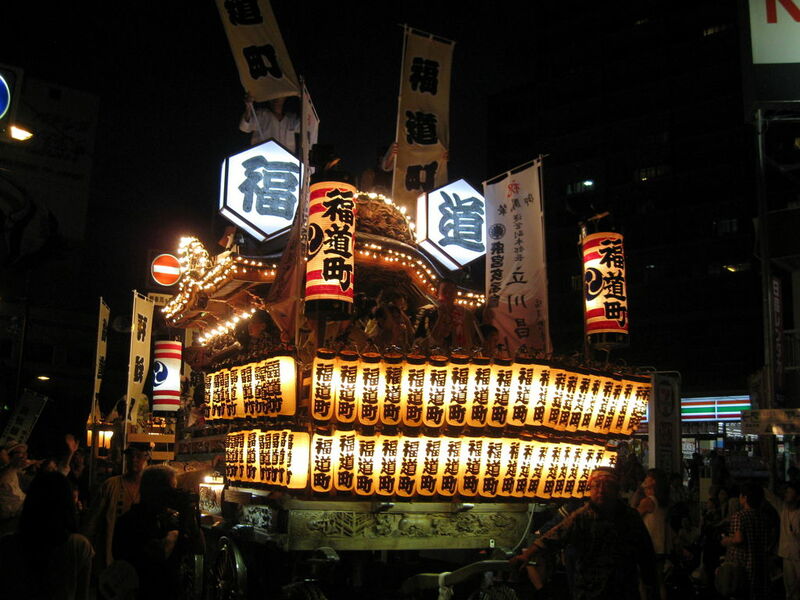 In Atami, all of the neighbourhoods and nearby towns all create floats to pull / drive down the main street. Most of the floats have two levels full of lights, drummers, and people in costumes making a lot of noise. In front there is a long rope so the float can be pulled through the streets. Most of the floats are motorized so the giant pull rope in front is for decoration. The floats are all competing against each other, so each one has unique designs, features and music. The effect is a loud, bright spectacle that you would not expect from a usually reserved society. One of the highlights for me was when two floats are passing in opposite directions, like in this video that I took. The float from Koalako’s area of Atami was easily the best of the festival. In previous years I had helped pull this float through the street, but this time I was able to be a spectator and enjoy the show. In addition to being the biggest and loudest, the float was equipped to shoot a shower of sparks into the air, resembling a large wooden dragon. Well, a wooden dragon covered in people with drums anyway. As usual, Koalako’s father was involved the float. We walked over to say hi and I was greeted with a huge smile and a firm handshake – very friendly and very un-Japanese. He made sure that his friend following behind hooked me up with a can of beer. Koalako’s father has always been a fun and friendly guy and around him the beer rarely stopped. After about 90 minutes of noise and standing in the heat, we decided to go to an izakaya so we could sit and chat. This involved a long, steep, hot, humid, terrible walk back up the side of the mountain. I am not sure who decided to build a city on the side of a mountain, but they HATED prairie people. At the izakaya we ordered the coldest drinks on the menu – frozen draft beer. The beer itself wasn’t frozen, but the head on top was frozen slush. This was an impressive gimmick, but made the beer difficult to drink. In the past, hanging out with Koalako would involve way too much bar food, too much beer and inevitably karaoke. This time was very subdued. We had too much bar food, just enough beer and no time for karaoke. Karaoke with Koalako is great both because she is a classicly trained singer with a beautiful voice, and more importantly she doesn’t complain about how awful and off key I sound. Summer in Japan is uncomfortably hot and humid. The only redeeming feature is summer festivals like the one in Atami. Make sure you dress cool, drink a cold one while walking through the streets, and always leave time for karaoke after. You are currently browsing the archives for the Koalako category.